As Volvo marches toward its stated goal of electrifying its entire lineup, the automaker has recast its Polestar performance-tuning division as a performance electric car brand. First to arrive is a sleek 2-door coupe with a plug-in hybrid powertrain, called the Polestar 1. 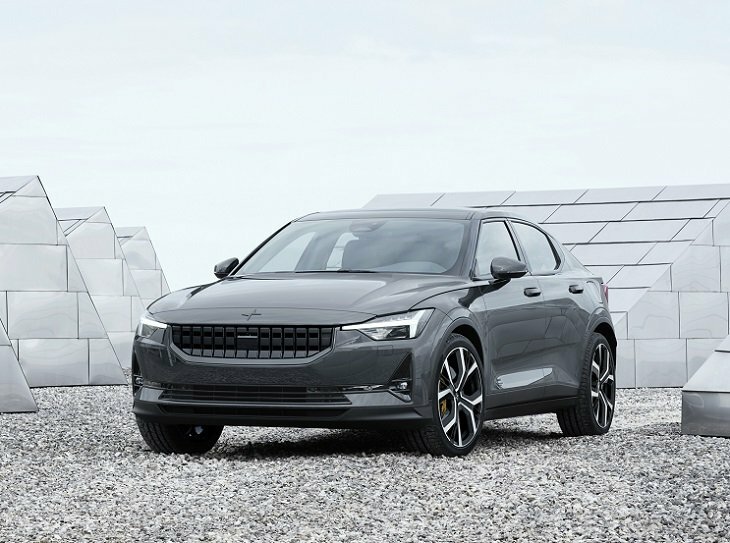 Shortly thereafter, the 2021 Polestar 2 will go on sale. A 5-door hatchback about the size of a Tesla Model 3, the Polestar 2 will be more affordable than the Polestar 1, and will offer greater utility thanks to its hands-free power liftgate and folding back seats. Take any modern Volvo, add kinks and creases, and you’ve got the design language for the new Polestar 2. Clean and purposeful, and riding on standard 19-inch wheels, the car reflects Scandinavian minimalism. Choose the optional Performance Package, and you’ll get a set of larger 20-inch wheels. This upgrade also includes Brembo braking components complete with gold painted calipers. Paint colors are rather subdued, but their names are creative. They include Snow, Moon, Magnesium, Thunder, Midnight, and Void. Volvo’s research shows that electric vehicle buyers are concerned about the environment, so in standard specification the Polestar 2 is equipped with textile seating material or, as an option, a “vegan” upholstery called Weave-tech that the company says is inspired by scuba diving suits. Premium Nappa leather is also optional. Textural 3D etched interior trim is also standard. Polestar 2 buyers seeking traditional wood trim can choose a Black Ash selection that the company applies to the car in such a way as to reduce scrap, or a lighter color reconstructed wood trim. A panoramic glass roof is standard, allowing plenty of natural light into the car. It is laminated for safety, and is designed to combat solar heating to the point where a shade isn’t necessary. Polestar promises a quiet, serene ride, and the car’s trunk measures 14.4 cu.-ft. behind the rear seat. Located underneath the seats and center console, the 78 kWh battery powers two 150 kW electric motors, one located at each of the car’s axles in order to provide standard all-wheel drive. Total output measures 408 horsepower and 486 lb.-ft. of torque, and the car’s software distributes the power depending on your driving style and surface conditions. Driving range is an estimated 275 miles, and Polestar says it will accelerate to 60 mph in 4.7 seconds. A blended regenerative braking system supplies what is called “one-pedal driving.” That means a driver, with careful planning, can limit or avoid use of the brake pedal and instead rely entirely on the friction of the regenerative brakes to slow or halt the car. As an option, Polestar 2 buyers can specify the Performance Package. It installs performance brakes with gold calipers, upgraded suspension dampers, and larger 20-inch wheels and tires. Inside, versions with the Performance Package have gold seatbelts. Volvo aims eliminate the possibility that one of its customers might die in a car crash, and with the Polestar 2 safety comes standard. Literally. Every driving assistance and collision avoidance system the company possesses is standard equipment on this car. Beyond the technology, the Polestar 2’s underlying architecture is specifically designed to protect the car’s occupants and its battery pack. Structural design and elements absorb and deflect crash energy away from the cabin, and Volvo expects the Polestar 2 to be one of the safest vehicles on the road. With the Polestar 2, Volvo reimagines its portrait-mode, tablet-style touchscreen infotainment system. It moves to an Android-based technology, thereby integrating features like Google Maps, Google Play, and Google Assistant. Via Wi-Fi, the software accepts regular updates, ensuring that it remains current for years to come. It is also compatible with iPhones, so don’t worry about switching if you’re an Apple devotee. Furthermore, the natural voice recognition system – based on Google Assistant artificial intelligence – makes it possible to issue commands for a wide variety of vehicle functions and with a minimum of hassle and distraction. While the 11-inch screen’s new graphics and simplified interface appear to be easier to use, the voice recognition technology could make that a moot point. Additional features include a Harman Kardon audio system, a 12.3-inch digital instrument display, and “phone-as-key” technology. By way of explanation, this means that as long as you’ve paired your smartphone to the car and it is on your person, the Polestar 2’s doors will unlock and the powertrain will activate. Note also that the Polestar 2 lacks a “start” button. Instead, when the car senses a driver in the seat, it makes itself ready to drive.